Could the day be coming when Dr. Seuss Enterprises doesn’t have a leg left to stand on? 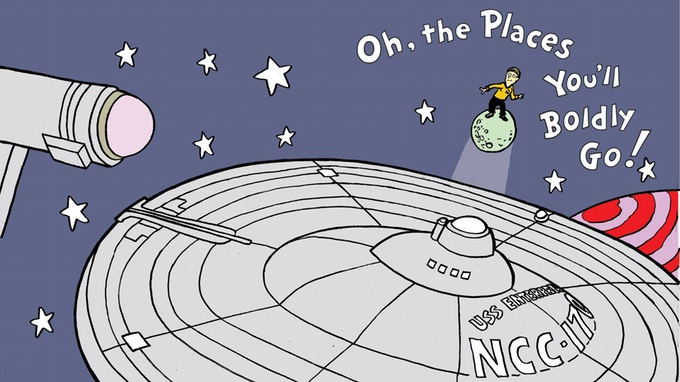 In November 2016, during a Kickstarter campaign to fund Oh, The Places You’ll Boldly Go!, featuring the writing of David Gerrold, the art of Ty Templeton, and the editorial skills of ComicMix’s Glenn Hauman, Dr. Seuss Enterprises (DSE) filed suit for damages claiming the project infringed their copyright and trademark on Dr. Seuss’ Oh the Places You’ll Go! A new ruling has disposed of the trademark claims. Although ComicMix suffered a setback in December 2017 when the federal Judge Janis L. Sammartino allowed both the copyright and trademark claims to go forward, on May 21, she applied a recent Ninth Circuit Court of Appeals precedent and granted ComicMix’s motion for judgment on the trademark issues. Only the copyright claims remain to be litigated. The Hollywood Reporter article “‘Star Trek’/Dr. Seuss Mashup Creator Beats Trademark Claims” briefed the reasons for ComicMix’s latest victory. …And but, something happened while all this was going down. Fox Television was caught up in a fight over the title of Empire, its hit show about a feuding music-industry family. Empire Distribution — a record label and publishing company that has worked with such hip-hop artists as T.I., Snoop Dogg and Kendrick Lamar — had brought its own trademark claims, but Fox prevailed, thanks to the Rogers test. This case went all the way up to the 9th Circuit Court of Appeals, which affirmed Fox’s win. Soon after Dr. Seuss Enterprises scored its victory in December, ComicMix pointed to the Empire case as having disavowed the Rogers footnote that had created an opening for trademark claims over titles. The parties are now scheduling witness depositions and preparing for the next round of litigation. This entry was posted in Poor Trufan's Almanack and tagged ComicMix, comics, David Gerrold, Dr. Seuss, Glenn Hauman, litigation, Ty Templeton by Mike Glyer. Bookmark the permalink. So that what Gerrold must be hinting at on his Facebook page, about the “good news” he just received. It’s so clearly a parody that I’ve wondered how this even went to court. Looking forward to someday buying this book. has become a 45-year-old woman who spends her days in a trailer home while battling alcohol and substance abuse, following a stint in prison for murdering her husband, the Grinch. That was decided by the Second Circuit Court of Appeals; the Seuss estate may try appealing further, but I doubt the Supreme Court will take an interest in this.